The Rest in Peace Department or R.I.P.D. is a 3D supernatural action adventure that stars Jeff Bridges and Ryan Reynolds as two cops who serve the living from the creatures who would not move on to the afterlife. The movie is distributed via United International Pictures through Solar Entertainment Corporation. This sci-fi film is about Veteran sheriff Roy Pulsifer (Bridges), who has spent his career with the legendary police force known as R.I.P.D. His mission is to track monstrous spirits that disguise themselves as ordinary people and bring justice by putting them out of Earth and receive their final judgement. Junior officer, Nick Walter (Reynolds), is a former rising-star detective that was paired with Roy. There, a top-notch partnership is formed whileuncovering a plot that could end life as we know it. Will these two officers restore the cosmic balance or will the afterlife continue to haunt the would with their evil deeds? 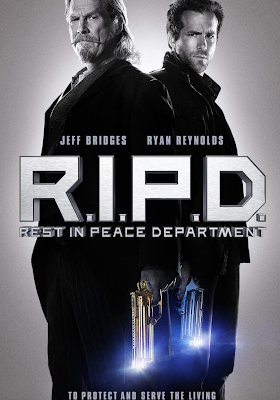 Starring alongside Bridges and Reynolds in R.I.P.D. are Kevin Bacon as Bobby Hayes, Nick’s partner before he’s taken out in the line of duty; Mary-Louise Parker as Proctor, Nick and Roy’s tough-as-nails bureau chief in the R.I.P.D. ; and Stephanie Szostak as Julia, Nick’s widow who must find out the reason behind his untimely departure before she is forced to play an unwelcome role in the world’s end. R.I.P.D. is directed by Robert Schwentke (Red) and produced by Neal H. Moritz (Fast & Furious series, I Am Legend), Mike Richardson (Hellboy, Hellboy II: The Golden Army) and Michael Fottrell (Fast & Furious series, Live Free or Die Hard). The film is is based on the Dark Horse comic created by Peter M. Lenkov , and it is from a story by David Dobkin & Phil Hay & Matt Manfredi. Catch R.I.P.D. this holiday, August 21, 2013. For more information and the latest updates on upcoming movies, Like Solar Entertainment and United International Pictures on Facebook at www.facebook.com/SolarUIPPhil.